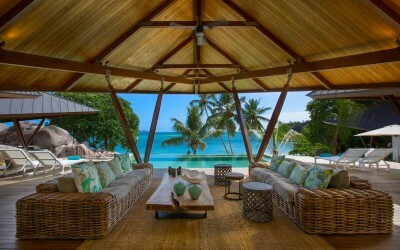 Deckenia consists of a five-bedroom luxury villa with an infinity pool, two private villas each with a private pool. Ideal for accommodating large families or groups of friends, the villa and the private villas offer beautiful views on the ocean. The villa is fully equipped and furnished and is only waiting for its guests to fulfill their every single desire. Three air-conditioned bedrooms, three bathrooms, a pool, a fully equipped, a kitchen, a TV room, a dining room /Lounge, a veranda, a bar, a guest toilet. Each villa presents itself like a little private retreat within an exclusive villa setting. One air-conditioned bedroom, one bathroom, a private pool a terrace. Space, comfort and privacy blend and merge into sumptuous furnishing. The modern architecture of the place is both luxurious and discreet; the peace of mind offered by this sleek and classy design makes you feel peaceful. Deckenia villa offers exclusive services. Everything you need, desire or dream of will be on your doorstep when you come and stay at Deckenia. Attentive staff will be by your side to offer you the most amazing holiday in paradise. Ultimate facilities and services will include in villa-dining (breakfast, lunch and dinner), a prestigious wine cellar, yoga sessions, a variety of leisure activities, access to the famous Raffles hotel’s spa, a game of golf on the Lemuria golf course and an endless choice of sea and marine activities. Take in the very best of what the paradise island of Praslin has to offer. Security : There is an electric automatic gate to secure the surroundings. Additionally, the villa is equipped with an alarm system covering the living areas and all rooms have their own individual safe. Discover Deckenia villa and its breathtaking natural setting and enjoy your holidays on the heavenly beaches, while being pampered by the dedicated staff of the villa. For daily rental prices for less than 10 adults, please don't hesitate to contact the staff of Deckenia villa. Local taxes, all meals (breakfast, lunch and dinner), Wi-Fi, boat house equipment. One off shore boat of 36 feet with three 250hp engines located just in front of the house with one skipper available, perfect for fishing as well as fora ride.